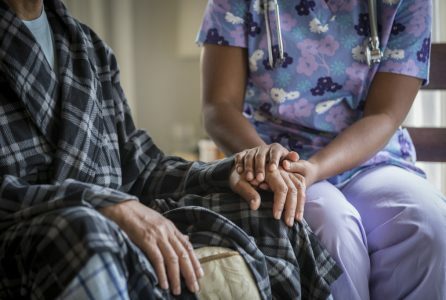 The review comes on the heels of a Kaiser Health News and New York Times investigation that found nearly 1,400 nursing homes report having fewer registered nurses on duty than the Centers for Medicare & Medicaid Services (CMS) requires or failed to provide reliable staffing information to the government. The Office of Inspector General said it would examine the staffing data nursing homes submit to the government through CMS’ new system that uses payroll records. That system gives a more accurate view of staffing than the self-reported numbers facilities had provided for nearly a decade. The IG said it would also look into how CMS ensured accuracy of the records, enforced minimum staffing requirements and rewarded facilities that exceeded those standards. Donald White, a spokesman for the inspector general, said the project was “part of our ongoing review of programs at the department.” The report is likely to be issued in the federal fiscal year that begins in October 2019. KHN’s analysis of the payroll records found thousands of nursing homes had one or more days where the facilities did not report a registered nurse on duty for at least eight hours, as required by Medicare. KHN also found great volatility in the staffing of certified nursing assistants day to day, with particularly low numbers on weekends. Those aides are crucial to daily care, helping residents eat, bathe and complete other basic activities. In July, Medicare assigned its lowest staffing rating of one star to nursing homes that did not meet the registered nurse standard, as published on the Nursing Home Compare website. Still, only about half of those homes saw their overall star rating — the most important consumer guide — drop. CMS declined to comment about the new examination. Toby Edelman, a senior policy attorney at the Center for Medicare Advocacy, said she hoped the probe would spur CMS to take action against facilities where payroll records show they are leaving residents with insufficient nursing coverage. “We know registered nurses are critical, and they are finding that they’re not there on weekends,” Edelman said. Earlier this month, Sen. Ron Wyden (D-Ore.), citing the KHN reporting, asked CMS to explain how it is addressing the issue of nursing homes’ inadequate staffing data or understaffing. LeadingAge, an association of nonprofit providers of aging services including nearly 2,000 nursing homes, said in response to Wyden’s letter that facilities have complained their data is not showing up correctly on the website and that “kinks” in the new system need to be worked out.